Introduction: Vestibular Rehabilitation is a therapeutic option in the treatment of dizziness that involves different health professionals. Objetive: The objective of this study was to verify if medical professionals refer their patients affected by vestibular disorders to treatment with vestibular rehabilitation, when necessary. Method: A structured questionnaire was applied to medical professionals belonging to the following specialties: internal medicine, geriatrics, otorhilaryngology, neurology and endocrinology. Seventy-two professionals answered and were divided in two groups: the first group was composed by resident and assistant physicians of the Hospital das Clínicas da Faculdade de Medicina de Ribeirão Preto (group 1); the second one by professionals working in private clinics in the city of Ribeirão Preto (group 2). Results: It was performed a descriptive analysis with the obtained data. In group 1, 80% of general practitioners (GP), 90% of endocrinologists and 40% of neurologists do not refer their patients to vestibular rehabilitation. In group 2, 75% of general practitioners, 67% of neurologists and 100% of endocrinologists also do not refer their patients to this therapy. Conclusion: It is up to different health care professionals clarify and disseminate the work of vestibular rehabilitation, especially to the otorhinolaryngologists, who are largely skilled professionals for diagnosing and treating dizziness and thus better for evaluating therapeutic procedures. Vestibular alterations, besides being common worldwide, interfere with the quality of life of patients who are affected by chronic dizziness, regarding physical, functional and emotional aspects (1). Vestibular involvement can be originated from several diseases belonging to different medical areas, once vestibular systems are very sensitive to distant alteration in the human body (2). Vertigo is a false sensation of the body movement, which is often horizontal and rotational, caused by the conflict between labyrinth sensorial information and visual and somatosensory information. This conflict prevents the physiological compensation that involves the adjustment of the intact components of the central nervous system (3) in order to reduce or annul the symptoms caused by vestibular lesion, without healing it. For these cases, compensation can be stimulated through repetitive physical exercises based on neural plasticity (4). Vestibular Rehabilitation (VR) exercises arose in England during the 40s, and which were described by Cawthorne and Cooksey, who observed an expressive improvement on their patients' dizziness symptoms when performing rapid head movement. These exercises consist of a series of eye, head and trunk movements; posture control in different positions; closed eyes exercises and others (2,5,6,7). "VR aims to raise visual stabilization; to increase vestibular-visual interaction during head movement; to provide a better static and dynamic stableness in situations of sensorial conflict and to reduce individual sensitiveness during head movement" (5). According to Ganança M. M. et al. (8) vestibular compensation can be achieved through neuroplasticity phenomena that are related to the vestibular system. The main ways of compensation consider designation terms from different authors; they can be adaptation, substitution, habituation, accommodation and compensation. Several patients may benefit from VR, such as those who suffer from chronic vertigo, stable vestibular lesion (paroxistic or not), non-compensate uni- and bilateral vestibular lesion, labyrinth diseases that do not respond properly to medicine; patients who cannot make use of drugs and the ones with chronic labyrinth disorders that are easily recurrent (2,9). VR is as important a therapy option as use of drugs and surgery for vertigo treatment. It is not a therapy to be chosen as a last option (9). Ribeiro and Pereira (2005) developed a study to verify if specific therapy approaches to the vestibular system produce motor leaning and contribute to an improvement on balance and decrease on falls; they submitted fifteen women to exercises by Cawthorn and Cookesey and compared to other fifteen who made up part of the control group; all of them aged between 60 and 69. After having performed such study, authors concluded the exercises improved the balance on that sample and, consequently, reduced falls (10). Yardley et al. (2004), based on the literature, reported that several studies on secondary cares (for instance, otorhinolaryngology and neurology) have provided that some VR evidences can be an effective therapy for dizziness (11). As regarding the importance of VR, it is necessary that patients affected by vestibular disorders might benefit from it. Due to that, there must be a permanent interaction among health professionals that deal with balance disorders in order to see a patient as a whole. Meireles and Erdmann (1999) analyzed different concepts of multidisciplinarity, pluridisciplinarity and interdisciplinarity, considering that multidisciplinarity and pluridisciplinarity are a "set of disciplines that are combined when solving a phenomenon or description of an object, without missing their specificity, structures or boundaries" and interdisciplinarity as an "inter-relation and interaction of the disciplines in order to achieve a common target. There is a conceptual unification of the methods and structures, and the discipline potentialities are explored and enlarged" (12). In this bibliographic review, the authors found that, in their experiments, interdisciplinary procedure is hardly present on the development of assistance and educative actions in health services. Implementations of integrate curricular proposals are still scarce; and health institutions which follow interdisciplinary procedure face difficulties that are able to be solved through discussion and team work (13). This study aims to verify if health professionals forwarded patients suffering from dizziness to Vestibular Rehabilitation therapy when etiological diagnosis agrees with the prescription. This work as well as the Free and Clear Consent Term were both approved by the Research Ethics Committee according to HCRP nº13983/2005. All participants signed the Free and Clear Consent term (Annex A). For this study, a questionnaire (Annex B) was applied to ten general practitioners, ten geriatricians, ten otorhinolaryngologists, ten neurologists and ten endocrinologists. Two groups of professionals were interviewed. The first group (Group 1) was composed by resident or assistant doctors of the Hospital das Clínicas da Faculdade de Medicina - Ribeirão Preto, and the second one (Group 2) was composed by doctors who worked in private clinics, in the same city. 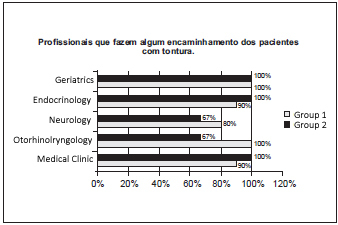 Due to the low number of professionals working in Geriatrics at the Hospital das Clínicas da Faculdade de Medicina - Ribeirão Preto, there were only seven questionnaire sets answered. Professionals belonging to group 1 were personally interviewed in the ambulatories of the selected medical fields. Professionals belonging to group 2 were randomly selected. The questionnaires were handed out through their private secretaries. They had seven days to answer all the questions. Fifty questionnaires were handed out (10 to each of the medical fields), but only 50% of them were sent back. Six of them were from the otorhinolaryngologists; six from the geriatricians; six from the endocrinologists; four from the general practitioners and three from the neurologists. After collecting all data, a descriptive analysis of the results was performed. Of the interviewed professionals from the Hospital das Clínicas da Faculdade de Medicina - Ribeirão Preto (Group 1), only one otorhinolaryngologist replied not to have seen patients complaining of dizziness. In that way, all the other questions would not need to be answered by this professional; and for the other following questions, the number of otorhinolaryngologists was nine (n=9). Most otorhinolaryngologists prescribe VR. All professionals who were interviewed in the private clinics (Group 2) replied to have already seen patients complaining of dizziness. The group consisted of four general practitioners (GPs), six otorhinolaryngologists, three neurologists, six endocrinologists and six geriatricians. The professionals belonging to Group 2 answered to all the other questions. When doctors from group 1 were asked on how many patients with dizziness they usually examine in a year, 100% (10) of the GPs, 66.7% (6) of the otorhinolaryngologists, 90% (9) of the neurologists, 70% (7) of the endocrinologists and 71.4% (5) of the geriatricians reported 25%. 22% (2) of the otorhinolaryngologists, 10% (1) of the neurologists, 30% (3) of the endocrinologists, and 14.3% (1) geriatricians examined around 50% of patients with dizziness. And finally, 11% of the otorhinolaryngologists and 14.3% of the geriatricians report to examine 75% of patients with dizziness. In group 2, four (100%) GPs, five (83%) otorhinolaryngologists, two (67%) neurologists, five (83%) endocrinologists and three (50%) geriatricians reported 25% of patient visits with dizziness in a year. Only one (33%) neurologist reported 75% of patient visits with dizziness in a year, and one (17%) otorhinolaryngologist, one (17%) endocrinologist and three (50%) geriatricians reported 50% of patient visits with dizziness. Tables 1 and 2 display the therapy for patients with dizziness prescribed by doctors from group 1 and group 2 respectively. Chart 1 displays the percentage of the interviewed professionals who forward patients with dizziness to some kind of therapy, also comparing groups 1 and 2. 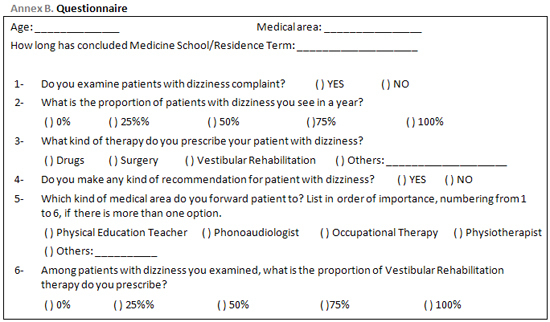 Chat 1 - Percentage of interviewed professionals who forward patients with dizziness to some therapy. Regarding the proportion of recommendation for VR therapy prescribed by doctors, the results were: in group 1: eight (80%) GPs, nine (90%) endocrinologists, and 4 (40%) neurologists do not forward patients to VR; 10% (1) of the GPs, 22.2% (2) of the otorhinolaryngologists, 20% (2) of the neurologists, 10% (1) of the endocrinologists and 42.9% (3) of the geriatricians forward around 25% of patients with dizziness to VR. The other 10% (1) of the GPs, 33.3% (3) of the otorhinolaryngologists and 14.3% (1) of the geriatricians forward 50% of their patients to VR; 44.4% (4) of the otorhinolaryngologists, 40% (4) of the neurologists and 28.6% (2) of the geriatricians forward 75% of their patients, and 14.3% (1) of the geriatricians forward 100% of their patients with dizziness to VR therapy. Among the professionals from Group 2, three (75%) GPs, two (67%) neurologists, six (100%) endocrinologists, two (33.3%) otorhinolaryngologists and one (16.7%) geriatrician do not forward patients to VR. Half of the otorhinolaryngologists (3) and the geriatricians (3) and 25% (1) of the GPs forward 25% of patients with dizziness to VR. Finally, 16.7% (1) of the geriatricians and 16.7% (1) of the otorhinolaryngologists, and 33.3% (1) of the neurologists forward 50% of patients to VR. Chart 2 displays the proportion of doctors who do not forward their patients with dizziness to VR therapy. 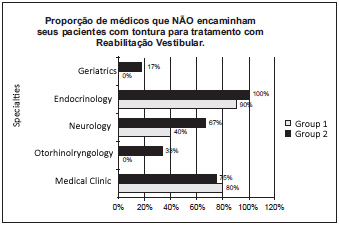 Chart 2 - Proportion of professionals who do not forward patients with dizziness to Vestibular Rehabilitation. Although 50 questionnaires were handed out to group 2, only 25 doctors, who work in private clinics, returned them properly answered. Most of the doctors reported lack of time to answer the questions, and some reported not having interest in doing it. Tschiedel et al. (2000) and Freire et al. (2000) also sent doctors questionnaires and reported the same reasons and difficulties to have questions answered (14,15). In this study, most doctors, from group 1 and 2, who examined patients with dizziness, reported 25% of these types of patients in a year, apart from the geriatricians, who work in private clinics. Half of the geriatricians from group 2 reported that 25% of their patients suffer from dizziness, and the other half reported 50%. Gomes and Santos (1999) researched the level of knowledge and the need of education and information that Portuguese physiotherapists, neurologists and otorhinolaryngologists have on VR in hospitals in Lisbon. Thirty five questionnaires were sent to doctors and 47% reported they forward their patients to VR and 53% do not (16). Similar to the current study, it was observed in group 1 that 54% of the doctors forward their patients to VR, while in group 2. 44% of the doctors forward them. It is interesting, though, to compare this proportion of prescription between medical fields. In Group 1, most of the GPs (80%) and endocrinologists (90%) do not prescribe VR, claiming that when dizziness symptom is treated by the doctors themselves, mostly with drugs, the patient is forwarded to an otorhinolryngologist, who prescribes VR when necessary. All geriatricians forward patients to VR therapy, while 40% of the neurologists do not. This dynamics can be understood by the fact that this tertiary hospital deals with a multidisciplinary service characterized by the presence of several ambulatories and clinics, by allowing a better relation between different medical fields. Despite this easiness and the fact that this is a university hospital some doctors report not knowing phonoaudiological speech therapy activity with dizziness through VR. In Group 2, no (0.0%) endocrinologists, most GPs (75%) and neurologists (67%), two (33%) otorhinolaryngologists and one (17%) of the geriatricians do not forward their patients with dizziness to VR therapy. It is known that Otorhinolaryngology is the medical area that works directly on the diagnosis and treatment of patients with dizziness and does also know the importance of the VR therapy, by forwarding patients when necessary, as mentioned in this study. However, it is also observed that other different medical areas assist patients who benefit from VR therapy. According to the literature, VR therapy is also recommended to patients who may present residual symptoms of post-coma; neurological surgeries; cerebral distress due to vascular failure; kinetosis and debarkation sickness; oscillopsia; vestibular disorders in the elderly with postural instability, defective body balance or psychological/psychogenic components; vertigo caused by labyrinth traumas; pregnant women with balance alterations; cranial trauma and others (3,5,8,9). Some authors have highlighted the importance of the multidisciplinarity on the treatment of patients with dizziness. Simonceli et al. (2003) encountered the need of a multidisciplinary approach among otorhinolaryngologists, geriatricians, heart doctors, phonoaudiologists and physiotherapists in order to obtain a complete balance rehabilitation, which reduces the risk and morbidities associated to falls and social isolation of the individuals (17). A type of multidisciplinary vestibular rehabilitation involving medical, audiological and physiotherapeutic action is satisfactory (18) as well as a multidisciplinary team of otoneurologists, occupational therapists, psychiatrists and social medicine activity are required to rehabilitation diagnosis and planning (19). A multidisciplinary assistance leads to a better understanding and efficacy on the treatment of patients with dizziness in a tertiary sector (20). Most medical professionals who do not have a specific relation with patients with dizziness, for instance GPs and neurologists, do not forward them to RV therapy. It was also observed that the professionals who work in private clinics in Ribeirão Preto do not forward patients to RV as much as the professionals who work at Hospital das Clínicas da Faculdade de Medicina de Ribeirão Preto. The otorhinolaryngologists and neurologists from private clinics forward patients with dizziness even less often, which can suggest a less effective interdisciplinary action among these professionals. When questionnaires were applied, some professionals, from both groups, reported not knowing the RV phonoaudiological activity or not forwarding their patients with dizziness to this type of therapy due to the fact they are not familiar with its recommendations. Therefore, there is a need to clarify and make RV work well known, as well as its targets, methods, recommendations by demonstrating the efficiency of this treatment to all health professionals who are related to patients with dizziness. 1. Apprentice (Private Clinic job). 2. PhD (Assistant Phonoaudiologist of the Hospital das Clínicas da Faculdade de Medicina de Ribeirão Preto - USP). Hospital das Clínicas da Faculdade de Medicina de Ribeirão Preto da Universidade de São Paulo. This article was submitted to SGP (Sistema de Gestão de Publicações) of R@IO on February 14th, 2007 and approved on June 27th, 2007 at 14:59:25.